An oscillating spindle sander is a benchtop (or in some commercial models, floor-standing) woodworking tool designed to sand the edges of boards. The sander has a small table top and a sanding drum that protrudes up through the rear portion of the table top. As the sanding drum spins, the drum also moves up and down, exposing nearly the entire surface of the sanding drum to the wood as it is sanded. This up-and-down action helps eliminate sanding grooves in the edge of the board, plus it allows even wear on the abrasive sanding drum. Some oscillating spindle sanders have a rather small table, whereas others have a larger table with the ability to angle the forward portion of the table up to 45-degrees, allowing for edge sanding of beveled boards. These larger table tops also may have a miter slot, allowing the operator to consistently sand the ends of mitered boards. Table-top models typically have a 1/3 to 1/2 horsepower motor, whereas floor-standing sanders may have as much as a 1 horsepower motor, which can power larger spindles (both in diameter and length). Some floor-standing models can also be wired for 220-volt power. Oscillating spindle sanders typically have a variety of sizes of sanding drums available. Bench top sanders typically will have five different 4-inch tall spindles ranging in diameters from 1/2-inch to 2 inches. Floor-standing models will have 8-inch spindles of up to 4-inches in diameter. Some models will also have a belt-sanding option. 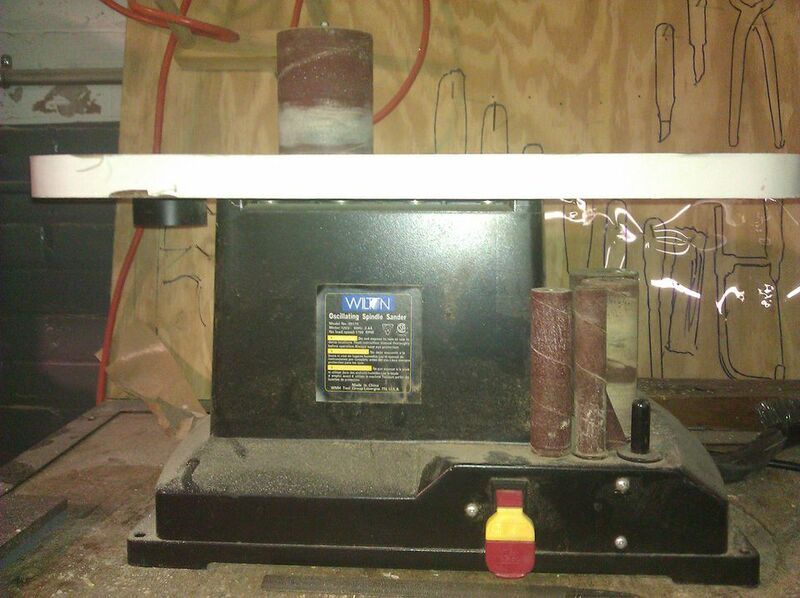 This is essentially an add-on to the spindle that converts the drum sander to an oscillating belt sander. The belt sander option uses the same standard 4-inch wide sanding belts that you'd use on your belt sander. 4-inch sanding sleeves to fit over the oscillating spindle sander's various sanding drums are commonly available at fine woodworking suppliers and home centers. These sleeves can be purchased with sanding grits ranging anywhere from 60 grit (coarse sanding) to 220-grit (very fine). Since sanding sleeves are relatively inexpensive, it is a good idea to keep a variety of grits for each available sanding drum available for use on your woodworking projects. Most oscillating spindle sanders have onboard storage for each sanding drum. To install a drum, select the sanding drum of choice, and slip a sanding sleeve of the same size over the drum. Next, locate the corresponding throat plate for the chosen drum, and slip it over the spindle and into the recess in the table. Then, loosen the nut on top of the spindle bolt, and slide the drum onto the spindle bolt. Tighten the nut and you're ready to sand. NOTE: For safety, always use the correct throat plate for the selected sanding drum to reduce the gap between the table top and the sanding drum. An oscillating spindle sander is perfect for sanding curved cuts created on a band saw. After cutting the curve close to the cut line, simply place the board flat on the sander's table a safe distance away from the drum and turn on the motor. Ease the board forward until the board comes into contact with the drum. Then, slide the board along the abrasive edge of the sanding drum (working in the opposite direction of the rotation of the drum), keeping the board flat on the table top. Working in long, smooth strokes to prevent uneven results, keep sanding until you reach the cut line. An oscillating spindle sander can also be used to sand long edges of straight cuts, but you'll need to create a fence jig. Find a straight, even 2 x 4 board, and drill a hole 2 1/4 inches in diameter, so that one edge of the hole barely intersects with one edge of the board. There should be about 1-inch of the hole exposed along the edge of the 2 x 4. Then, after installing a 2-inch sleeved drum onto the sander's spindle, slip the jig over the drum. Adjust the edge of the jig so that the sanding drum's abrasive surface is barely exposed beyond the long edge of the jig, and secure the jig with a clamp on each end. To sand a straight edge, turn on the sander and place the board to be sanded against the 2 x 4 fence jig. Ease the board forward and back, keeping it flat against the fence and the table top, until the edge of the board is sanded evenly flat. Many oscillating spindle sanders will have a dust port on the back side of the body of the sander. Connect the dust hose from your dust collection unit or shop vacuum, and turn on the dust collector or vacuum before beginning sanding. As noted earlier, be sure to use the proper throat plate for the chosen sanding drum, as the minimal space between the plate and the sanding drum will keep the pressure of the air flow high, allowing for better dust collection. As with any sanding operation, the best results are typically achieved by using progressively finer abrasive grits as you progress. In other words, start your sanding with a coarse grit (60 to 100), then sand again using a medium grit (120 to 180), followed by a fine grit (220 and higher) sanding. Each successive sanding will reduce any sanding marks created by the larger grit of the previous sanding and will give you a smooth, finished edge.